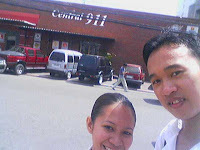 Tramz Corner: The Central 911 DAVAO! Yesterday, we had our organizational analysis visit on the Davao Central 911. Our group was very privileged to interview the Control Officer Unit of the institution. I as resident of Davao City is very proud of this institute. 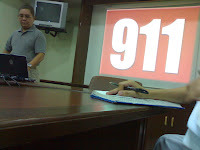 For those who do not know as an organization, the Davao City’s Central 911 is a fully integrated, computerized response system linking the people of Davao City to the emergency resources of the government. It is patterned after the emergency dispatch system in the United States and Canada that enables people in need of emergency services by simply dialing 911 on any landline and cellular phone, residents of Davao City are able to access the emergency resources of Central 911. It utilizes the Emergency Computer Aided Dispatch system of the Davao Light and Power Corporation to easily pinpoint the location of the emergency and dispatch the appropriate responder with at least possible delay. The Central 91 1 provides assistance on police, medical, fire and rescue emergencies. It even has its own K-9 unit for cases necessitating the use of bomb and drug sniffing canines. With the help of Central 911, it enables public safety agency to respond to emergency cases in a more effective, quick and coordinated manner, thereby saving lives, protecting properties, stopping crimes and preventing in major fire cases in a systemic and efficient way. And mind you it is only in Davao! 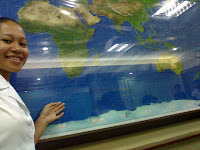 Next to Candada and United states, something that we Dabawenyos must be proud of. this is great! this adds the many great things in Davao.. how i wish to visit again Davao City not just to eat and smell durian but to see the inner beauty of the city! Please register to this forum. A discussion to improve about Davao with our Mayor Duterte.